Don’t you get tired when you hear words like: “nativistic mania”, “simplistic assumptions”, “nostalgic”, and “sentimental notions”? Not to mention the stronger ones: “native-plant fundamentalist”, “xenophobia”, “native plant Nazi”? Most of us involved on growing native plants in our gardens have read Doug Tallamy’s book “Bringing Nature Home” and find it inspirational. It is clearly written for the general public and presents the argument for native plants in a lucid, forceful way. The book’s thesis is substantiated by abundant references. New research by him and his team and by others following in his footsteps supports the principal arguments of this book even more strongly. That is why I am deeply troubled by those who dismiss Doug Tallamy’s work as lacking scientific evidence or being merely anecdotal. By extension, they dismiss the logic behind our commitment to restoring native habitats. I have been concerned about non-native organisms since the 1960s and 1970s when I saw the impact that firethorn and privet had on my native land of Argentina. At that time, I had read about the disastrous consequences of introducing rabbits to Australia, and thought that humans may have learned the lesson. I was totally wrong; species introductions by humans continue to increase all over the world. “BringingNature Home” crystallized many ideas that were already in my mind. It made so much sense that, despite my scientific training as a biologist, I didn’t feel the need to check the science behind it. However, some of the recent discussions have moved me to take a closer look at the methodology, the collected data, and interpretation of the results in order to evaluate the evidence behind the native plants/wild life connection. Most gardeners do not need to bone up on the technical and scientific aspects of the issue. It is possible to trust a respected author, accept his lucid reasoning, and employ common sense and everyday observation to confirm the truth behind the concept. But perhaps it may be helpful to present a distillation of some of the work that led to the conclusions about the negative impact non-native plants have on wildlife. So, I will give it a try. I will briefly summarize two of Doug Tallamy’s scientific papers on the subject. There are others equally important that use different approaches to provide different sorts of evidence on the importance of native plants for wildlife. All of them combined strengthen the views presented in “Bringing Nature Home” even further. The first one, “Impact of Native Plants on Bird and Butterfly Biodiversity in Suburban Landscapes” (By K. Burghards, D. Tallamy and W.G. Shriver. Conservation Biology, 2008 ) compares the abundance and number of species of birds and caterpillars in two types of gardens. Six gardens were composed entirely of native plants; the other six were conventionally landscaped with a mixture of native and non-native plants. The six pairs of gardens were carefully matched by size, plant cover and diversity and other variables to eliminate any factors that could give false results. For instance, conventional gardens with large expanses of lawn were not included as no native plants garden would match that. They counted birds by species, total numbers of individuals and numbers of breeding pairs in both sets of gardens. They also counted the number of caterpillars identified by species in a sample area of each set of gardens. The results are very clear. With only minor exceptions the native gardens held larger numbers of caterpillars and birds, a wider variety of species and more breeding pairs of birds. It is worth noticing that there were more birds of those considered of conservation concern in the native plants gardens. It is very likely that the results would have been more dramatic if conventional gardens with large lawns had been included, rather than only those which were well matched for total plant cover. 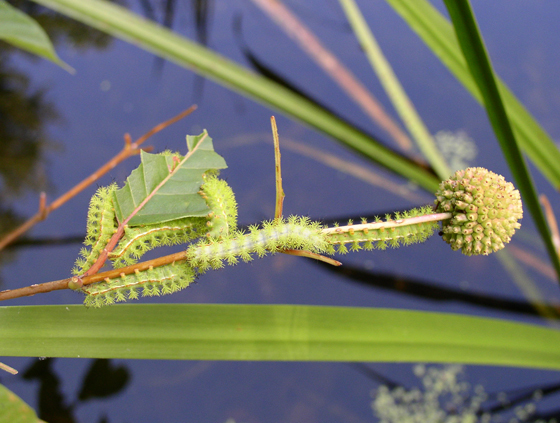 In the article “Can alien plants support generalist insect herbivores?” (by D. Tallamy, M. Ballard. 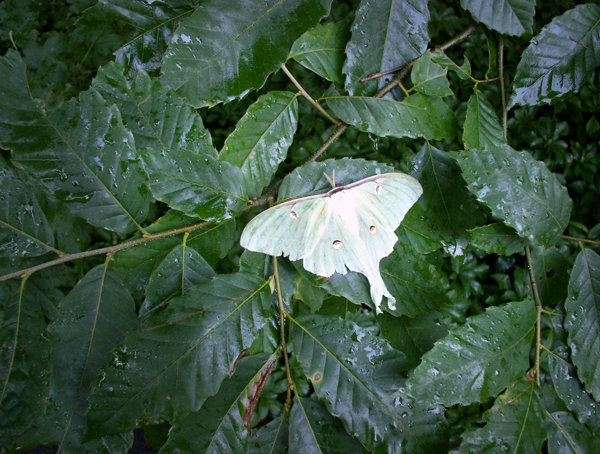 Biological invasions, 2010) the authors confronted the argument that goes: “generalist insects can feed on introduced plants as well as on native ones” by rearing moth caterpillars on their preferred native host plants as well as on a number of frequently used ornamentals, all of them non-native. For this study they chose four different species of moths that are known to feed on a wide range of plants: luna moths, yellow-striped armyworm, bagworm and white-marked tussock moth. They collected eggs and reared them in an assortment of the most common introduced ornamentals, such as Ailanthus, Bradford pear, Norway maple, Japanese honeysuckle and garlic mustard, just to name a few. Woody non-natives were chosen for those species that feed predominantly on woody plants; herbaceous plants for those that prefer herbaceous. For comparison they also raised larvae on one of the known native host plants: black cherry, sweet gum and field bindweed. The results are overwhelmingly clear. All these moth species did best on the native plants. Most non-native plants failed to provide any nourishment and caterpillars promptly died. 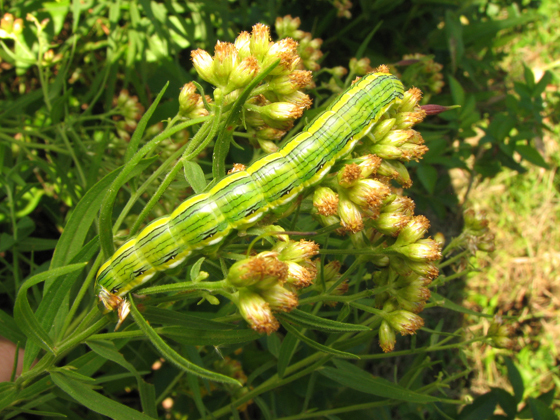 The few non-natives that sustained some caterpillars until the end of the experiment did so poorly: the percentage of survivors was significantly smaller than on native plants; the weigh of the larvae was also smaller. They conclude that the results “support the hypothesis that alien plant invasions may seriously disrupt terrestrial food webs by reducing the insect biomass required by insectivores in higher trophic levels.” In other words, non-native plants provide less food for insect-dependent wildlife, such as many birds, small mammals and amphibians. “. A. A. Flanders, et al. The Auk). The exotic grasses reduced the numbers of breeding pairs in all five species studied. Work done in Montana (“Insect Assemblages Change Along a Gradient of Invasion by a Nonnative Grass“. A. R. Litt and R. J. Steidl. Biological Invasions, 2010) indicates that the abundance and number of species of insects decrease with increasing abundance of a non-native grass. Farther yet, research in the Azores (“The Impact of Alien Plants on Native Biota in the Azores“. R. Heleno. Thesis, 2008) also shows that non-native plants affect the abundance of insects and, as a consequence, that of insectivores. Restoration efforts bring back some of the original biodiversity. I will stop now. You get the picture: all these scientific studies document the negative impact that non-native plants have on food chains from plants through insects to the wildlife that feed on them. Knowing the evidence substantiated by carefully planned and statistically significant research gives you the intellectual tools to present your case to others. Anecdotal examples can also be of value. When the numbers of instances observed by those who do gardening with native plants begin to pile up, they acquire increasing weight. Many gardeners are very good at taking notes and keeping track of changes in their gardens. I invite all of you to report your observations on the gradual return of birds, butterflies, and other wildlife to yards where non-natives are being replaced by native plant cover. 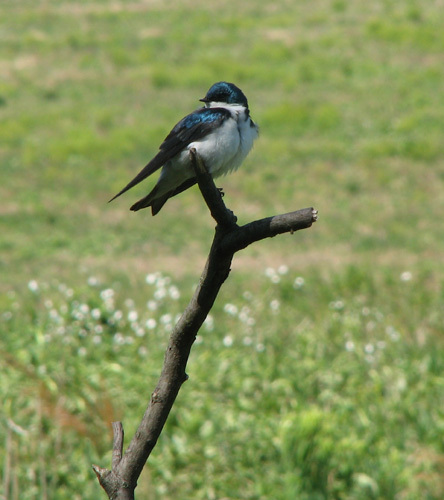 The conservation value of residential yards: linking birds and people. Preferences for exotic flowers do not promote urban life in butterflies. Urban biodiversity: comparison of insect assemblages on native and non-native trees. Mortality of a herbivorous insect is greater on non-indigenous congeneric compared to native rush in coastal salt marsh. Influence of invasive palms on terrestrial arthropod assemblages in desert spring habitat. Reproductive Success of Chestnut-collared Longspurs in Native and Exotic Grassland. 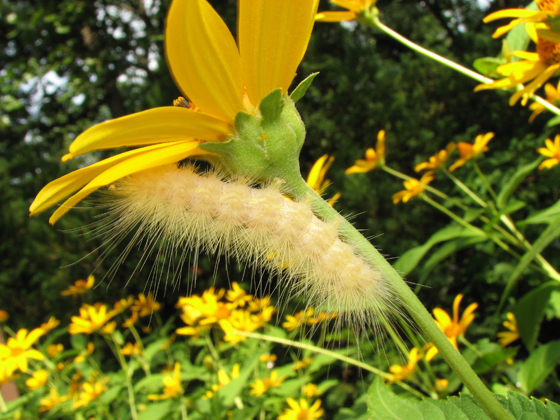 Attractiveness of Michigan Native Plants to Arthropod Natural Enemies and Herbivores. That said, the reason Doug Tallamy deserves special credit is that he was able to see a connection that others have missed before. Many works prior to Tallamy’s show that relatively natural or stable ecosystems (composed mainly of native plants) support a wider variety of wildlife, or have more biodiversity, than ecosystems where introduced plants predominate. © 2014, Beatriz Moisset. First published in Native Plants and Wildlife Gardens.